Dutch designers Miriam van der Lubbe and Niels van Eijk invited us to do a concept dinner for them and their friends at their own house. 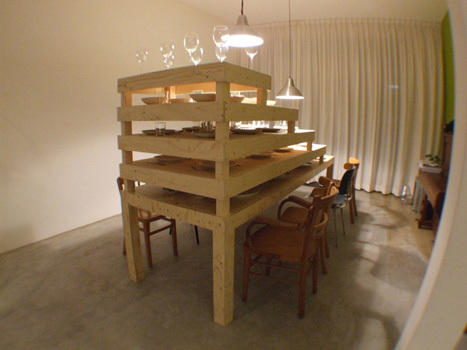 We based a concept on their living room table (which was designed by Niels van Eijk himself). 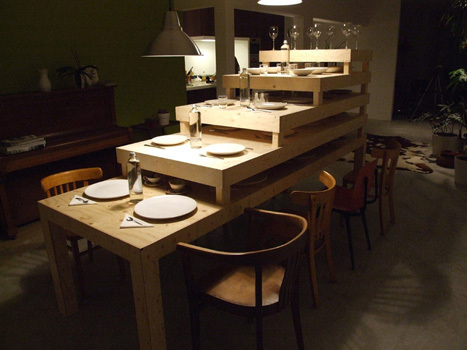 We made 4 smaller tables to fit on the existing one and placed them on top of each other, creating a stack of 5 tables. We set all tables in advance for serving 5 courses. After every course we took away the table and cut them into pieces with a chainsaw in the garden. We used the wood of the tables for the stove in the garden to cook the tiger prawns for the third course. The different heights of the tables bring up a question for the guests: Are you sitting or standing? This turned out to be a nice side-effect during the dinner.